Anyone who has read accounts of Nazi Germany or Stalin's Russia or junta-ruled Argentina (Uruguay, Chile, Bolivia) will recognize the "mechanisms of terror" Didion and her husband John Gregory Dunne found on a two-week visit to El Salvador in June 1982. One doesn't have to visit a body dump or the San Salvador morgue to know about the daily killings. One needn't even have lunch with US ambassador Deane Hinton--crystal glasses, profiteroles--to realize that we've been fooling ourselves, with their complicity: "trying to get the Salvadoran government to 'appear' to do what the American government wanted done in order to make it 'appear' that the American aid was justified." And that, for the Salvadoran part, "'anti-communism' was seen, correctly, as the bait the United States would always take." In the light of the last half-century, it can't be argued that attention-getting Americans like Didion shouldn't add their denunciations to what human rights organizations (Amnesty International, the American Watch Committee) have documented and the press has reported. Press attention, in particular, constantly shifts--bringing a much-remarked end, Didion notes, to the Hotel Camino Real's breakfast buffet. Such precise observations are rare, however (though not entirely absent--re Ambassador Hinton: "Someone who is about to marry a third time, who thinks of himself as the father of ten, and who has spent much of his career in chancy posts . . . is apt to be someone who believes in the possible"). Much that is said about El Salvador--from the "elusive shadows" to the ersatz ethnic dances--could equally be said about other such situations. 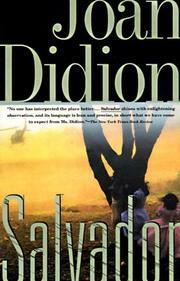 And Didion's dry runs, her admission of how hard it is to find out anything--combined with her professed intent to learn "la verdad," as if the truth were ascertainable (even with more time and broader contacts)--make this a document of passing interest, better suited to its original publication in the New York Review.